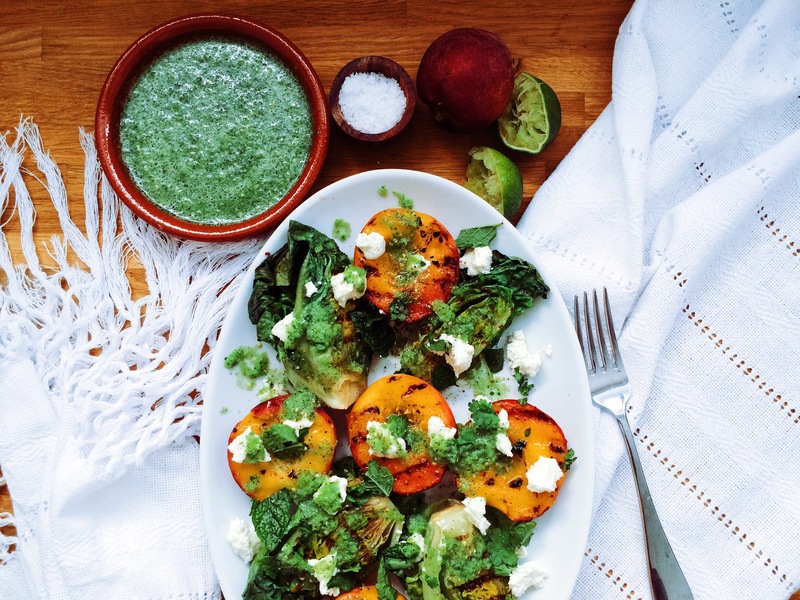 Today is the first day of summer and to celebrate this day I decided to cook a lovely recipe with ingredients that are in season and peaches and gem lettuce are so lovely at the moment and if grilled, it intensifies their flavour. I know there are many simmilar recipes like this, but I made it my own by making a tomatillo, also known as Mexican husk tomato, salsa dressing. I really hope you like this recipe, if you try it, send me a quick message letting me know your thoughts about it! Grilled the gem lettuce, peaches and place on a big platter.Scatter the goat cheese, some fresh coriander and fresh mint over the top. To make the dressing. Place the tomatillos, jalapeño, onion, some coriander, juice of lime and blend, not for long, so you still have some texture in the salsa. Add 1/4 cup rapeseed oil and stir. Add salt and pepper to taste.Pour the dressing over the salad. Enjoy it with grilled chicken and potatoes.